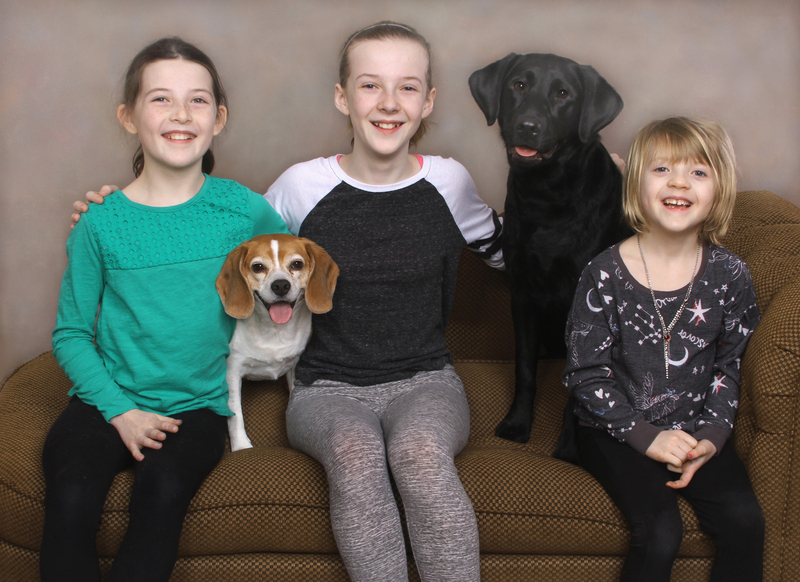 Kids and dogs together in a portrait is always a fun challenge. One of my goals for the portrait session to be a success is for the children to have fun and that their personalities will shine thru while keeping eye contact on the camera. In addition to these two important things is the added responsibility that they need to keep control of the dogs, too. As you can imagine there is a lot going on while portraits like this one are being made. The kids can become discouraged and want to give up. The dogs can be too active and hard to control. My duties are more than just being the photographer. It is important that I act as a cheerleader, directing and encouraging the children and also making the noises and various sounds that keep the dogs attention and focus. I promise you a session like the one that produced this portrait was a high energy, fast paced bundle of excitement. Sister having fun! Dogs, not so much.